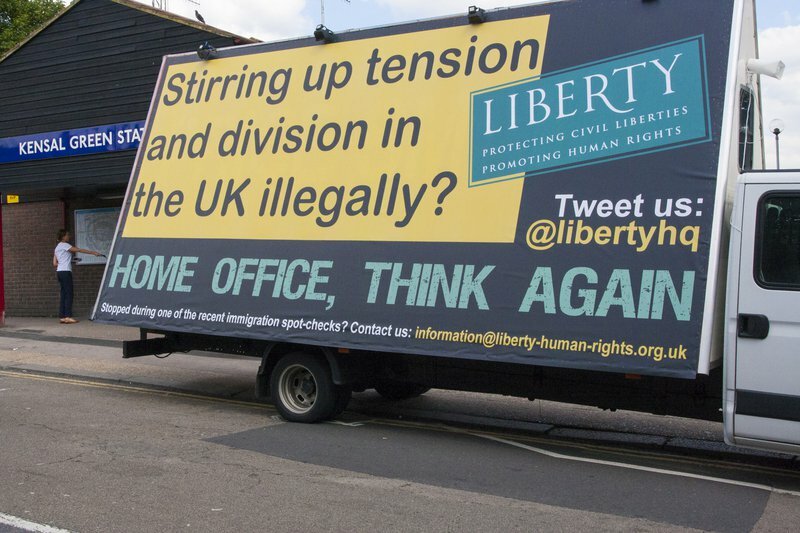 Campaign group Liberty's response to the Home Office's racist 'go home' vans. Most people, apparently, agree that immigration is out of control in the UK. Supposedly we all think immigrants are to blame for lack of jobs and housing. Public opinion seems strongly behind harsh measures being taken to stop immigration. This scapegoating and stereotyping of migrant groups is becoming an ever more prominent feature of British life. Politicians and the press are locked in a cycle of ever-heightening anti-immigrant rhetoric that they present as ‘what people really think.’ The current debate does not address how government and media have been instrumental in the creation of anti-immigrant narratives. Challenging this thinking seems hopeless, but each of us can start by refusing to use terms such as 'illegal', 'bogus' or 'criminal'. In doing so at an individual level, we start to reconceptualise a range of experiences of migration that fall outside easy labeling. This avoids inaccurate generalisations that allow separation of immigrants into a class of people seen as sub-human. In this way, we move from encouraging and colluding with the exercise of state power to actively resisting it. Yet constantly hearing about the ‘wave’ of ‘illegal immigrants’ that are ‘invading’ the country severely impacts public opinion. John Grayson argues that politicians and the media have actively created a racist electorate over the past 15 years, while embedding racism in British politics. A 2003 study found words used in racist attacks and street harassment directed at immigrants mirrored themes current in newspapers. This rhetoric and narrative also converts opinion into ‘fact’. When even the Office of Budget Responsibility notes that immigrants make a more positive contribution to UK finances than non-immigrants, it is obvious that public perception of immigrants overburdening the welfare system are based, not on the figures, but on inaccurate media and political portrayals. The wonderfully rich and recently published Bad News for Refugees documents fabrications in reporting and the pressure exerted by editors on journalists to write slanted articles. It also records the ways in which media coverage has legitimised political action, with severe negative consequences for refugees, asylum seekers and migrant communities. The headline-hitting ‘go home’ vans and racist stop and search practices are just icebergs beyond which lies a steadily escalating range of anti-immigrant policy. Proposals to charge migrants for healthcare and to force landlords to check immigration status have been under-reported. They would also encourage suspicion against anyone who has an accent or looks black (used here in a political sense). Such measures would have devastating consequences for those unable to access services as a result. This increasingly xenophobic and racist immigration reporting and policy is supposed to represent popular thinking. Politicians represent these narratives, not as the result of personal prejudices, opinions and judgements made for political expediency, but as uncomfortable truths that ‘we’ must address. Journalists often project assumptions onto people living in areas with high numbers of recent (visible) immigrants rather than attempt to have meaningful conversations with them. Action on Racism and Xenophobia, an alliance of activists and academics of which I am a member, went into these communities to speak with people living there and find out what they think. Our results challenge the narrative that people want immigration to be stopped by any means necessary. In fact, the majority of those we surveyed disagreed with government tactics. 79 percent thought it was wrong to carry out immigration checks based on skin colour, 77 percent thought racial-profiling in immigration checks would impact community relations and 25 percent believed the aim of government policy was to increase intolerance. This research challenges popular opinion and recent polling results. It appears that, if asked properly, people have a more nuanced analysis than is contained in media-friendly sound bites. Those who have personal relationships with people across divides of religion, culture, ethnicity and length of family residence can actually be more progressive than the politicians meant to represent them or journalists meant to hold these politicians to account would have us believe. Going to school, living next door, being friends and talking on the train with each other creates human relationships and brings understanding of each other’s lives. Local coverage of asylum and immigration is likely to be more positive and less hostile than national coverage because it focuses on interactions between individuals new to the country and settled communities. It becomes more difficult to demonise ‘those immigrants’ if you know them. These bonds serve as the best form of resistance to internalisation of a drip-drip of anti immigrant sentiment – the personal influencing the political writ large. Let us recognise the myth of the ‘indigenous’ British person for what it is. The British Isles has experienced a long history of emigration and immigration over thousands of years. What varies among all of us who have ancestral histories of migration is visibility and ability to assimilate. The transnational lives and histories of the ethnic majority population are often lost, as is the rich history of black peoples living in this country from medieval times onwards. No matter how many generations our families live here, we are always seen as having migrant background. This is not true of our white French, Canadian or Australian friends. Nobody can trace their ancestry in an unbroken family line stretching back to pre-Roman times. Ministers, parliamentarians, the Royal Family, union leaders and FTSE 100 board members are certainly unable to do so. This goes for black communities too. Too many of us wish to pull the ladder up after we have got on board, distance ourselves from immigrant struggles or denigrate people who have just arrived, for example by calling them the derogatory ‘freshies’. An anti-racism that looks to make small changes in immigration policy and practice does nothing to challenge the inherent violence of the system itself. The response to being targeted by racist immigration policies should not be to insist that we are the ‘good, legal kind of immigrants’ or that we are British through and through. It should be to recognise the common humanity of us all – whether with status or not. If recent policy is an attempt to reach voters ahead of the 2015 elections, it is based on dishonesty. The problem is not immigration per se but socio-economic inequality, with widespread poverty, exclusion and youth unemployment faced by working class people of all racial backgrounds and immigrant statuses. Pointing the finger at immigrants is an attempt to mask how current government policy actually exacerbates inequality. We must take action against demonisation of immigrants: it is simply another divide and rule tactic. Rather, we should challenge not just the racism but also the anti-immigrant nature of policy and discourse and recognise how these are inextricably intertwined. Instead of blaming immigrants for taking away jobs, housing and other benefits (a claim not borne out by facts), we need to translate our personal relationships with one another into examination of structural inequalities that affect us all. We must seize control of the debate on immigration away from scaremongering, inaccurate media stories and politicians chasing votes. We need a nuanced discussion that reflects reality. Let's decide what kind of country we want to be. Is it one in which anyone seen as ‘foreign’ is questioned and unwelcome? Or are we a nation that is open to flows of new ideas, technologies and peoples? Do we redress deep-seated structures of inequality and dominance or do we scapegoat our already most vulnerable and marginalised?